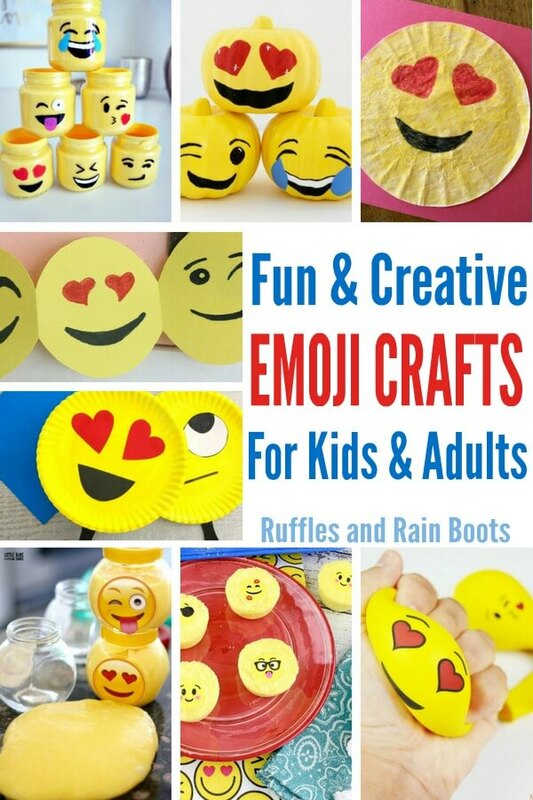 These emoji crafts for kids are perfect for an Emoji Movie night or an Emoji Party. We have crafts for all ages and skill levels, so let’s get started. Well isn’t this just grand? Something which didn’t even EXIST when I was a kid is now everywhere: movies, food, clothing, and crafts. The emojis have taken over pop culture! No matter where you are in the world, some emojis are universally understood. I’ve seen emojis being used in classrooms to help kids identify and work through emotions. Whether you’re here because you want some fun for an Emoji Movie night family fun, an Emoji party, or just because the kids love them, enjoy! 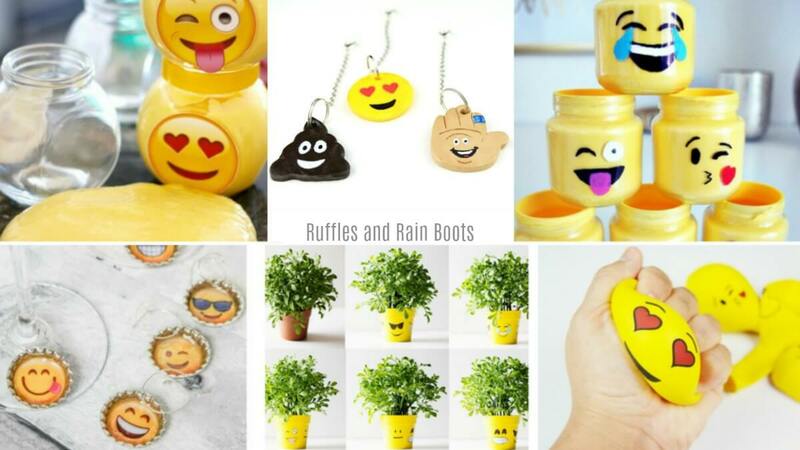 Clay Emoji Backpack Tags by Ruffles and Rain Boots – Yep, we’re no stranger to fun emoji crafts for kids! This fun project is perfect for a tween or teen sleepover. Emoji Slime by Little Bins for Little Hands – This is just perfect for a tween slumber party! Duct Tape Bookmarks by Schooling a Monkey – Duct tape manipulation should be a life skill. This DIY bookmark craft qualifies! Emoji Salt Dough Beads from Red Ted Art – These absolutely crack me up! I can’t wait to whip up a batch of salt dough. Emoji Pumpkins by Fun Money Mom – Oh, someone just raised the bar on Halloween. Look at these cuties! Emoji Pudding Cups by Our Kid Things – Quick? Yes. Easy? Yes. Cute? You bet! Emoji Pencil Toppers from School Time Snippets – A simple paper craft for all ages, this is one of the easiest emoji crafts for kids. Emoji Hand Puppets from Pocket Tot – Felt is a crafter’s best friend (next to wine). Emoji Paper Plate Craft from Natural Beach Living – Oh, these are awesome! They are perfect to help young kids identify and work through emotions. Coffee Filter Emojis by Look, We’re Learning – This would be a great craft for Kindergarten or young primary school classes when discussing feelings. Emoji Needle Felting Craft by Adventure in a Box – If you’re into felting, these are absolutely adorable. Emoji Drink Tags from Create, Craft, Love – These aren’t necessarily a kid’s craft, but the adults sure will appreciate them. Emoji Mason Jars from Our Messy Table – These are a cute way to repurpose baby food jars or mason jars. Emoji Flower Pot from All for the Boys – Is it wrong that I might make one of these to hang on my office door? 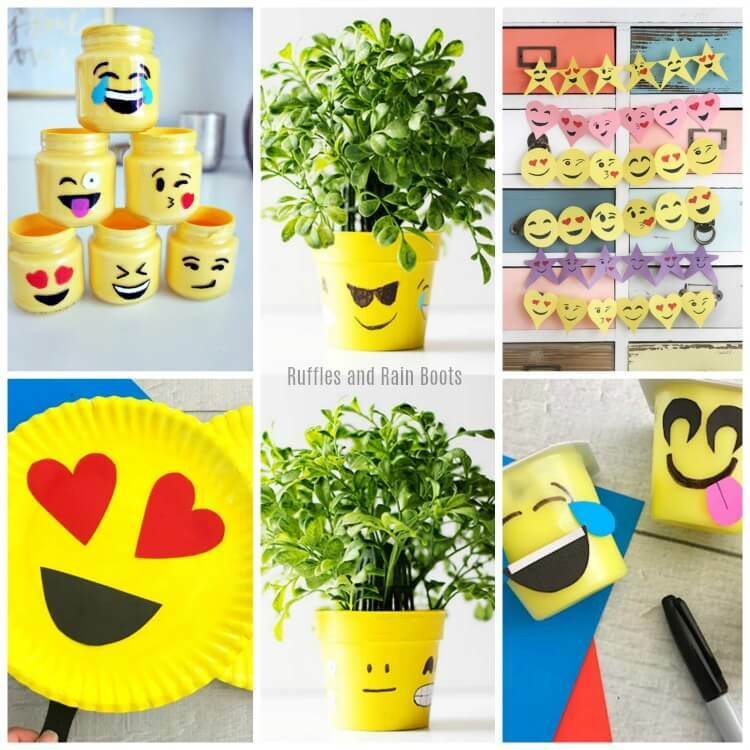 Which is your favorite of these emoji crafts for kids or “big kids?” I have a TON of coffee filters left over from flower making, so I may set that up for Elise after swim lessons.